For Heather Marie, improv is cardio, a workout for your mind and body. 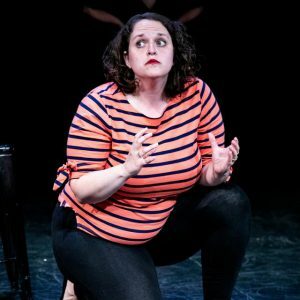 Heather Marie believes that everyone should do improv: it’s all about bringing a slice of life to stage with a heightened reality. Heather Marie’s teaching and coaching focuses on the fundamentals of clear game, strong relationships, and specific characters to build levels of fun that should be illegal. Heather Marie works to foster classrooms full of joy, supportive teamwork, and community. Heather Marie finished the WIT curriculum in 2016 and started teaching in 2017. Heather Marie is the founder of indie team Rancy Neagan and the founder and artistic director of The Bechdelprov Project, both featuring all-female casts. She also plays on duos The Newlydeads and Hurt Angry Afraid. She has performed in theaters throughout DC and Baltimore, and at the Del Close Marathon in New York.